Selecting the type of yacht charter in Greece can be confusing with all the different styles available. Use our comparison guide to help you decide. Charter in the Greek Islands concept is above ‘Bareboat with Rent-a-Skipper’ yacht charter and slightly below the traditional fully crewed yacht charter sailing holiday. 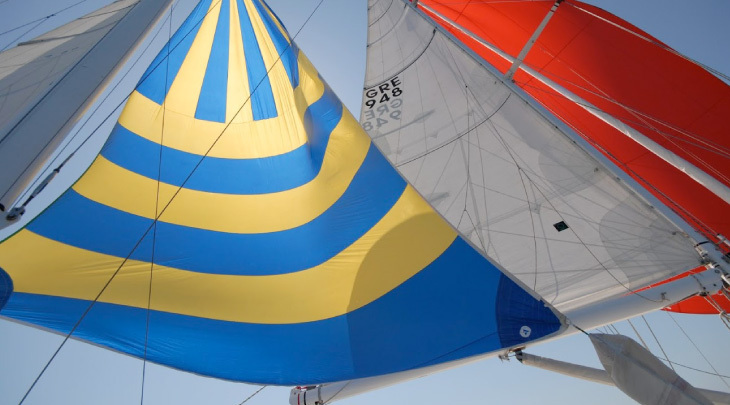 Our one Price Policy means that we don’t charge extra for the items needed on a quality sailing holiday. Once you get on our yachts, that’s it— it’s all paid for! 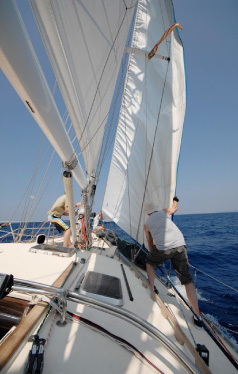 On the other hand, the uptight white-shirted, white gloved crew scene isn’t us… OK we do wear ‘Yacht’ shirts and use sailing gloves but over all our concept of sailing is easy-going relaxing and fun! What is a captained yacht charter greece ? The most usual way to have a sailing holiday in Greece is to charter a Bare-Boat Yacht, from a broker. This means you get a “BARE” boat – pretty much everything else you pay for… (provisions, water, fuel, mooring fees, insurance, end cleaning – sometimes you even pay extra for an outboard engine!). If you don’t have a qualified yacht captain in your group, then you hire a local one. They don’t call them ‘Rent-a-Skippers’ for nothing! The more up-market option is a fully crewed yacht charter sailing holiday. This is where you are treated like a VIP on a very expensive yacht and the crew cater to your every whim and desire. Of course you pay for this style of treatment. This is why we are different …..Compare the table below and decide for yourself which is the best option, with No hidden costs, for your sailing holiday in Greece. Yacht Equipment A well equipped yacht with MCA/ORC standard safety equipment, latest electronics, state of art sails and all the bells and whistles to play with. Basic Bare boat equipment, minimum required safety gear and a basic no frills yacht. All yachts have to meet MCA/ORC safety, other than that you take your pick, generally these yachts are well equipped. Skipper Yes. All our Captains are ASA/RYA certified, speak English as well as Greek and other international languages. In some cases the Captains also own the yachts so are very familiar with their yachts. They know the coolest local places to go, and are the ones cooking up a storm in the galley at times! Your insider connection to the locals and the Greek Islands. No. He is an extra: €130 – 150 Euro a day. “On duty” time generally considered to be sailing only. Think of him as a taxi driver, who also wants a tip at the end of the charter. He also will need you to pay for/provide skipper’s meals too. Yes. Everything fully catered. Usually an onboard cook who deals with all shopping, cleaning, etc. Skippers are usually familiar with local areas, and can tell you the best places to go. Informal sailing tips always available! As we also run ASA Sailing schools our captains are also instructors too. We’re more than happy if people want to get involved in sailing the yachts. Sometimes. Depends on the goodwill of the freelance skipper you get. Depends on skipper/crew. Guests aren’t generally expected to take an active part in the sailing. Dinners No. Usually ashore, but we are flexible and sometimes do dinner on board instead of lunch. No extra cost. Also figure in one night beach barby on a deserted island. No No. Usually ashore. Dinners onboard possible, cost usually $30 – 35 per person. Liquor No No No. On board drinks at bar prices. Cabins Double cabins or bunks each cabin has its own private bathroom. Depends on boat layout. Shared double cabins or bunks. Yes, we will pick you up and take you to the yacht, also return you at the end of the trip. No. Get yourself to the marina and find the yacht, if you can! Yes, generally included. Linen and Towels Yes. Made up and ready for you first day; after that, it’s up to you. We supply 2 large bath towels. Yes (make your own beds). Towels well you have to see them! Luxury Extras Standard includes: 220 generator service, wireless internet on all yachts, cell phone usage if needed, plus dive gear, water toys etc. No. Remember this is bare boat. Some companies do offer things like a windsurf etc… at an extra cost. Depends on yacht but generally lots of extras you will have to pay extra to use. Provisions Yes. Full breakfasts, lunches, soft drinks, unlimited help-yourself snacks, fresh fruit, etc. And do’nt be surprised if the Captain takes you out for a special lunch time treat somewhere. No Usually breakfast, lunch, soft drinks and snacks included. Price Average €1200/wk per person. All inclusive, except Air-Fares and dinners. For our whole-boat charter rates, once you add up all the extras for a bareboat-with-skipper, our prices are generally less. Varies according to boat chosen. A 50’ bareboat yacht varies from €5500 – 7500/wk. Plus all the extras. Cabin layouts will be either 3 or 4 and depends if they each have there own private bathrooms. The Captain may even have to use a guest bathroom too!! Varies *hugely* according to yacht. Usually all-inclusive, except dinners, mooring fees and a 4hr limit on motoring time per day. Generally a great deal more expensive than either bb-with-skipper or our Captain yacht Charter Sailing. NOW YOU HAVE A FULL COMPREHENSIVE GUIDE TO WHAT IS AVAILABLE FOR CHARTERING A YACHT IN GREECE, VISIT OUR CHARTER FLEET.